The systemic flaws of the privatization that took place in the 1990s and 2000s, and even more so their economic impact shaped a permanent sense of wariness among ordinary Ukrainians about selling off public assets. With time, however, paternalistic attitudes faded as the state proved to be an extremely ineffective owner. Today, this is talked about not only by specialists but also by the country’s leadership. “The state is an ineffective owner,” said President Poroshenko in March 2018. “Its management tends to mostly lead to losses.” It’s hard not to agree with him and the Government’s intention to continue privatizing, but on a transparent basis at this point, can only be welcomed. The “spirit of capitalism” really does push the private owner to fight for a profit and to maintain a competitive edge. However, the country has an interest, not just in the profitability of a business, but in its integrity as well. State oversight need not be total, but it should be effective. Otherwise business risks becoming a generator of economic, social and political problems rather than the source of a society’s well-being. The Cabinet decided this year to privatize a number of oblast power companies or oblenergos, the Odesa Port Plant, and a series of other major assets. But the issue is not just how clean the process will be. It’s equally important whether the government will be able to make the new owners operate these businesses with integrity. As can be seen with the natural gas delivery sector these days, there’s not much reason to feel optimistic. In the gas delivery sector, things also started with major privatizations, as the old soviet gas companies were auctioned off. Although the larger part of gas pipelines remains in government hands, the actual operators, called oblgaz or oblast gas company and miskgaz, or municipal gas company, are attractive items. Their profits may be relatively small, because natural gas rates are set by the state through NCREPU, the regulator. However, the oblgazes, like the smaller-scale enterprises, are monopolists because only one operator can service the network in any given territory. Moreover, such companies are guaranteed multimillion clients, given that Ukraine was a gas-dependent country and is likely to remain so for a long time to come. 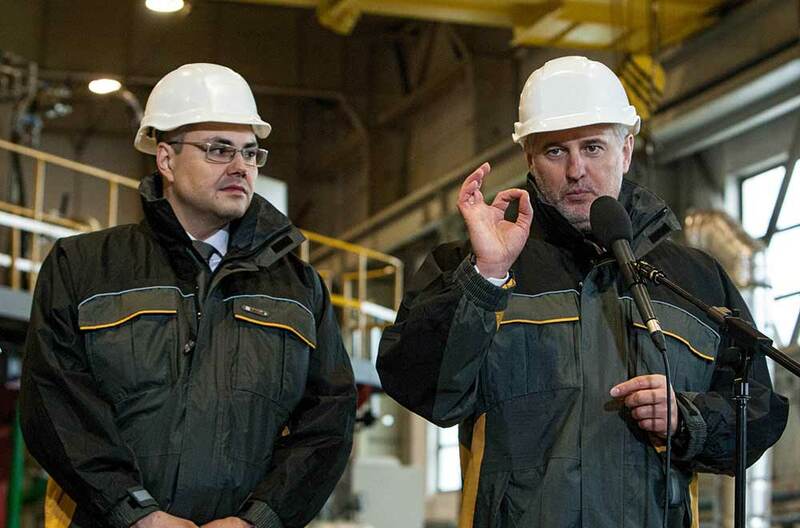 Not long after being privatized, this natural monopoly became a monopoly squared as 70% of the operators, including 16 oblgazes, now belong to oligarch Dmytro Firtash. In order to buy up these companies, the tycoon took advantage of the full-bore support of the Viktor Yanukovych regime. It looks like that was the point when Ukraine was expected to inject the Russian gas needle as strongly as possible, and the business nozzle attached to this needle was supposed to be Firtash’s holding company. In time, of course, the Yanukovych regime collapsed, the one-time Regional lost his political clout, and Firtash found himself facing a mess of court cases. Meanwhile, the state has tried to intervene in the situation, but has so far not enjoyed any notable success. And reasons to intervene are plenty, starting with debts. As of today, NAK Naftogaz Ukrainy boss Andriy Kobolyev says Firtash’s operators owe the national pipeline UAH 30.4 billion and his gas extraction companies owe UAH 29.3bn, for a total of nearly UAH 60bn altogether, or US $2.2bn. Meanwhile, the operators that are part of Firtash’s group of companies, Regional Gas Company, regularly report that they are losing money. For instance, last September, they mentioned UAH 8.3bn, explaining that the-then rates were too low, too many customers owed them, and so on. In April 2017, the Cabinet began requiring the oblgazes to pay for using the gas distribution system, which the Azarov Government had transferred to them for free use, based on commercial management contracts. But even this was not very smooth going. “Firtash’s oblgazes don’t pay the state for the use of the pipeline network, yet they are using them and are withdrawing some of them from state ownership,” says MP Tetiana Chornovol. In response to her enquiry, it became known that as of June 20, 20198, the state budget had only received 0.07% of planned annual fees for the use of pipelines. How these operators manage to survive in the face of colossal debts is a separate epic. But the fact remains that even with profitability taken into account, at least in terms of contributing to the national budget, the gas supply sector remains extremely problematic. The government also hasn’t been able to do anything about the monopolized nature of this sector. Back in 2015, a new Law “On the natural gas market” stated that one and the same company could not operate the pipeline network and sell gas to households. This rule was supposed to ease the access to customers for alternative suppliers and launch a market competitiveness mechanism. But operators got around this rule easily enough, spinning off parallel companies that sell the gas: all the oblgazes and miskgazes now had “gazzbut” or gas sales companies attached to them. The next danger signal came at the end of 2018. In November, news began to come out that in various regions of Ukraine customers were unexpectedly getting warning notices that they had incurred debts. The oblgazes insisted that the debt was due to a recalculation of the volumes of gas used between December 1, 2015 and September 30, 2018. Supposedly, the volume of natural gas goes down during the cold season and meters understated consumption. In this kind of situation, the supplier uses a certain boosting coefficient, “bringing in line with standard conditions,” which resulted in customer bills reflecting sudden debts. What’s more the sums involved were substantial, from a few hundred to several thousand hryvnias. And although the gas companies explained that the notices of debts outstanding were merely “informative,” the public didn’t respond quite so laconically – especially since gas rates were raised just before this. The Government also turned to the National Commission with a request to check whether all oblgazes were operating within the law. “We have to be strict with monopolies so that they don’t go beyond what is normal and legal,” said Groisman. How this review might affect the situation will become clear in time, but so far everything seems to be in a clinch: having allowed a monopoly to be established, the government was unable to effectively oversee it and now seems unable to tame the monster. A review will probably be too little to effect change. It’s also entirely possible that these unexpected debts were added on in order to shore up the monopoly status of the gazzbuts in case alternate providers show up. If consumers decide to end their relationship with a given oblgaz, this virtual debt could be laid at their feet and give them a simple choice: either stay with us or pay off your debt. For an individual household, this is not a particularly strong argument, but individual households also do not typically change suppliers. But it means that entire population centers would have to pay a significant “buyout fee.” In this situation, it looks like oblgazes are preparing for the next round in the fight with the state, which is in a position to encroach on the monopoly in gas distribution. Already last year, Naftogaz established three subsidiaries that are supposed to supply gas to households, cogeneration plants and commercial consumers without going through the oblgazes. Naftogaz officials are making no bones about the fact that they are doing this in order to break up the monopoly position of Firtash’s organization. The company makes no bones about the situation: “The Government can and should change the organization of gas supplies to household so that there isn’t any more special treatment for Firtash’s oblgazes and monopolist intermediaries, and Naftogaz could deliver gas directly to households,” Naftogaz tweeted in September 2018. It’s quite possible that this strategy could reach the desired goal. However, how much of a victory will it be? Over Firtash and his business partners, yes. But it’s questionable whether this will demonstrate the state’s capacity to establish effective oversight over private owners, and in this case, the owners of oblgazes. Because this entire story comes down to the fact that the government at first allowed these pathological processes with the oblgazes to develop and now wants to simply amputate, like a limb infested with gangrene. Let’s assume that this is the only possible response and that Naftogaz’s subsidiaries will carry out the functions of the current operators far more effectively. At least, in contrast to oblgazes that are constantly posting losses, Naftogaz is a profitable corporation today. Nonetheless, such an approach cannot be treated as universal, because overcoming the negative consequences of privatization by expanding the government sector is basically swapping a stitching awl for a scratching one. The logical outcome of this approach will be building state capitalism or some such monstrosity. In the end, learning to tame big business and carrying out privatization will just have to go on simultaneously, along with all the inevitable side-effects. Who Needs a Democratic Azerbaijan?